Navona square is a wonderful example of urban continuity in Rome: indeed it sits over the area of the Stadium, which was built by Domitian before 86 d.C., for athletics competitions of Greek origin, the agones, very appreciated by Domitian, but not much by Roman people, who liked violent and bloody performances such as the munera and the venationes. The stadium was about m. 275 long and m. 106 wide: the outer part had some arcades resting on pillars of travertine with Ionic semi-columns in the first order, Corinthian in the second order. Two main entrances opened in the middle of the long sides, another was in the middle of the curved side, with a colonnade with portasanta marble columns in front of it. This area, discovered in the years 1936-1938, is the best preserved part of the stadium, and it is visited entirely during our trip with a special licence of the Superintendence. The cavea of the stadium included two maeniana (lines of steps) superimposed: according to a calculation made on the basis of the length of the lines of steps, the seats for the spectators are 30.000, a number which is equal to the capacity transmitted by the “Cataloghi Regionari”. After being abandoned, the stadium housed early a small chapel dedicated to St. Agnes, martyred there in 304 b.C.. During the middle ages the area of the stadium was deserted and mostly cultivated to vegetable gardens and fields; in the second half of the 15th century, the shifting of the market from Aracoeli to Piazza Navona led to an outbreak of liveliness whch is still today a characteristic feature in comparison to the other squares of Rome. The building was discovered in 1866, during one of the several excavations of the 19th century undertaken to recover art works. This took as a reference an ancient wall coming from the garden of a private house on the square Monte di Fiore, in front of the square of Saint Crisogono, both disappeared during the recent urban reorganization of the district. Since the first phases of the excavations, it was immediately clear the function of the rooms brought to light on the basis of the great quantity of graffiti on the walls, where the inscription “VII Coorte dei Vigili” was mentioned again and again. In particular the building was identified with a excubitorium or guards structure, obtained, towards the end of the II century a.C., from the interior of a private house, bought or hired from the public Authority. The monument consists of a great room, and in the middle of an hexagonal basin with concave sides. In front of it, on the southern wall an elegant arched door opens, which leads to larario, a sort of chapel of the guardian genius of the firemen, the Genius Excubitorii mentioned on many graffiti. The room situated west with the floor of terracotta interrupted in the middle by a cover is thought to be a bathroom , while it is not clear the function of two adjacent spaces and communicating on the opposite sides. We find a restricted ambulatory and a room with a “dolio”, container used to conserve wheat, pulses and oil, situated north. The archeological site of S. Paolo alla Regola is situated under the sixteenth century Palazzo degli Specchi, Via di San Paolo alla Regola n. 16 (VII Regola District), corresponding to the ancient route which connected the Circus Flaminius with the area of the Campus Martius. Under the reign of Domitian the area was occupied by the Horrea Vespasiani, a complex of warehouses that developed along the river between the modern Via dei Pettinari e Via Arenula. Under Severus reign the area undergone several changes: near and on the warehouses some insulae with four floors were built, and later destroyed by a great fire. 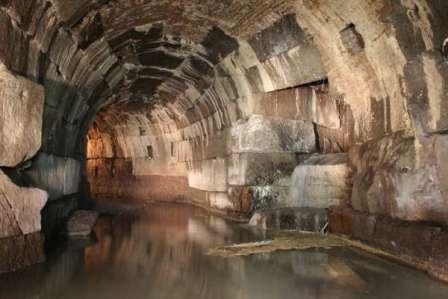 Under Constantine a floor of the palaces was converted into a basement to protect the buildings from the overflowing of the Tiber; after being used for a long time the buildings were finally neglected. 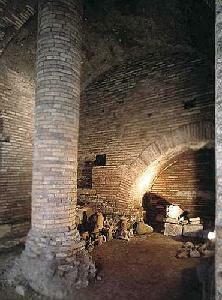 The insula di S. Paolo alla Regola consists of two big brick Horrea with barrel vaults, on the second underground level 8 metres deep from the level of the modern street. The first underground level of the insula consists of a series of warehouses of the Severus period which surrounded a courtyard; a firm modern wall stands out, used as a support for the 16th century vaults on which the overlooking Palazzo degli Specchi is placed. The other two rooms floored with mosaics are the first floor of the palace, whose ground floor was taken up by the warehouses; the black and white mosaics with geometric design are of the Severus period. 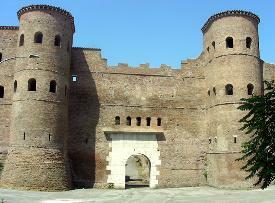 Porta Asinaria is the most beautiful and most preserved gate which opens in the town walls built by the emperor Aurelian in the second half of the III century b.C. Under the reign of Honorius (beginning of the V century) the simple passage was converted into a real fortress, with the two high circular towers with four levels. Both towers were connected by two covered arcades, over which the daily rounds took place. The gate was crossed by a street which had the same name Asinaria, and which stimulated much the imagination of the pilgrims and of the visitors of the 14th and 15th century. Apart from the several legends derived from the name of the gate (and of the street), it is likely that the name comes from the console Asinio Pollione, who built this street at the end of the Republican period. The name of Monte Testaccio derives from the Latin word testa, that is “coccio” (fragment), referring to the material used to built the artificial hill, namely with the amphorae discarded by the Horrea dell'annona. The clay fragments are glued with a binder of mud and sand, while at the top a subtle earth layer has promoted the development of vegetation, which confers a natural look to the hill. Its perimeter is 700 metres, it stands 36 metres high and covers a global area of about 22.000 square metres. Thanks to the consular dating obtainable from the seals of the olive oil amphorae it is possible to date the dumping between 140 b.C. and the half of the III century b.C. Many clay fragments come from the amphorae coming from the Betica, Roman province corresponding to the modern Andalusia, while some fragments come from the olive oil amphorae of Africa. Among the monuments discovered at the foot of the Capitoline hill, the most interesting is no doubt the great Insula (condominium with many storeys) at the foot of the stair of Aracoeli. The building, laying on the face of the Capitoline hill, includes a ground floor, a mezzanine, four floors with small apartments and rooms, in which space was very uncomfortable and restricted. The insula dates back to the II century b.C., and represents very well the intensive housing of the imperial period. Many districts consisted of condominiums of this kind, where plebeians lived in poor hygienic and environmental conditions, often at risk of collapses and fires. The visitation in the insula dell'Aracoeli is a good occasion to have a very clear view of the daily life in Rome during the imperial period. 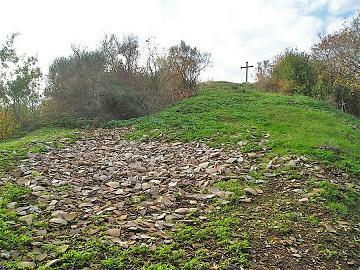 The modern Via Statilia corresponds to the pathway of the ancient Via Caelimontana: along this pathway there were many sepulchres of different periods and architectural structures. A well-preserved complex (and which you can visit it) consists of a set of four aligned sepulchres, discovered at the beginning of the 20th century, which underwent great restoration works. The first in order of topography is the sepulchre of the freedman Publio Quinzio, a bookseller, his wife and his concubine. It is datable chronologically around 100 b.C. and it consists of a blocks of tuff in which there is a door, which led into the funerary room, excavated in the rock. The second is a sepulchre of the freedmen of the gentes Clodia, Marcia and Annia, it is coeval to the first and it consists of two cells, in which you enter through two doors, framed on the outer side by a front with base of tuff. 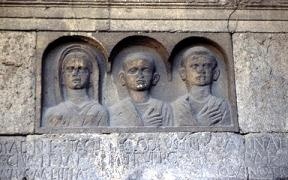 The portraits of the deads carved as bas-reliefs are placed on it . 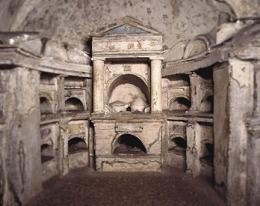 The third sepulchre is a colombarium; not well preserved, subsequent to the first two sepulchres. The fourth funerary complex, the most recent of all ( middle I century b.C. ), has an ara shape ; it belonged to the Aulii Caesonii and Telgennia. The Nimpaheum of Via degli Annibaldi was discovered in 1895 during the works for the realization of Via degli Annibaldi, and today it is cut in two by the wall that retains the street. It was originally semi-elliptical with a basin at its centre, and decorated with niches, four of which still visible. The curved wall is decorated by a rustic mosaic; the pilasters are decorated by small shells, while the bigger ones are embedded in the middle. Other nice decorations are of mother-of-pearl and enamel, with fragments of pumice stone and debris. The monument dates back to the end of the republican period and the beginning of the Augustan empire. 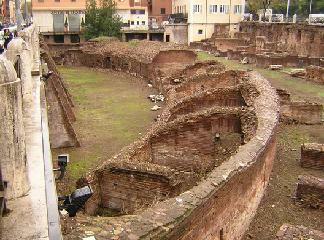 The remains of a brick building of the Imperial were found during the works at Via dell’Ara Massima in 1931. This building overlooked the carceres of the Circus Maximus. It was a small cult place dedicated to the oriental god Mithras, who was portrayed on a relief together with the other gods Cautes and Cautopates, Sun, Moon, the Crow. The writer of the dedication of the sanctuary was a Tiberius Claudius Hermes, who after a vow, built at his own expense the relief with the image of the God Mithras. 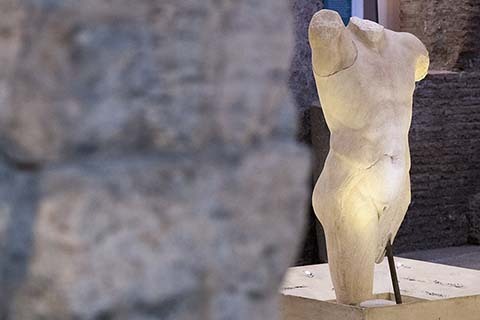 The Auditorium of Maecenas was discovered in 1874, during construction of Via Merulana and Largo Leopardi. This hall brought to light was part of a broader complex, situated between the “Servian Walls”, which was demolished. Only the so-called Auditorium was preserved, a great hall with apsis, which was 24 metres long, divided in a vestibule, the real hall, an exedra with steps and a double ramp for access to the south-west, about 2 metres wide. The complex was realized in opus reticulatum of good manufacture therefore very ancient. 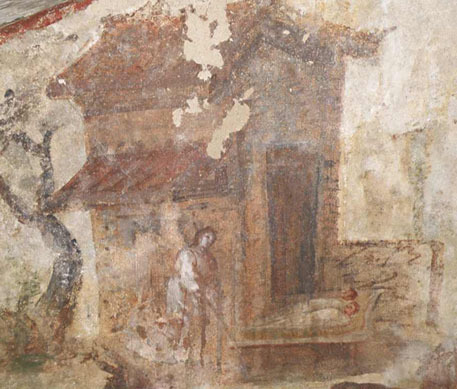 The pictorial decoration, well preserved when discovered, is today quite neglected. The walls are red; over the niches of the great hall there is a theriomorphic decoration with figures of animals; The interior of the niches was decorated with realistic representations of gardens. 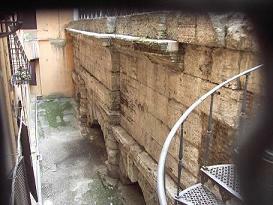 The exedra has seven very narrow steps, originally covered by layers of cipolin, of which only a few fragments survive. The upper part of the great hall and the exedra were decorated with wide layers of colours and small candelabrums with botanical motifs. The Auditorium of Maecenas can be dated to the late Republican Period, while the pictorial cycle of III style to the Augustan period. The place corresponds to a part of the Villa of Maecenas on the Esquiline hill . The Ludus Magnus is the most important gladiatorial arena in Rome situated east of the Colosseum between Via Labicana and Via di San Giovanni in Laterano. It was built contemporaneously with the amphitheatre Flavium. 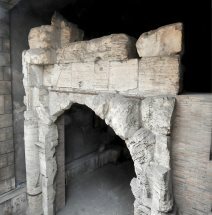 It represents one of the many buildings of Rome used for the organizations of the circensian performances: other buildings were, for example, the Castra Misenatium, where the mariners of Capo Miseno fleet lived, specialists in the manoeuvres of the velarium of the Colosseum, the Armamentarium, namely the depot of the gladiatorial arms, the Saniarium, a kind of rudimentary first aid, the Spoliarium, where the bodies of the dead gladiators were undressed, the Summum Choragium, were the stage machinery was conserved ,etc. The Ludus Magnus had a brick quadrangular courtyard , including a small elliptical arena, similar to the arena of the Colosseum, but smaller, used for the training of gladiators. The small arena communicated with the arena of the Colosseum through an underground passageway, which allowed the direct passing of the gladiators into the Colosseum to fight, preventing the throng of people stopping around the amphitheatre. The colombarium of Pomponius Hylas is situated in the Parco degli Scipioni, between the via Latina and the via Appia. Steep stairs lead to a small funerary chapel, founded during the Julius-Claudius period but used until the period of Antoninus Pius, with changes in the decorations dating back to the Flavian Period. In front of the stairs there is one of the most ancient walls mosaics found in Italy, made with glass tessera on a blue background bordered by a row of shells, which includes the name of the couple , Pomponio Hylas and Pomponia Vitalinis, whose ashes are conserved in urns placed in the niche on the mosaic. The sacellum is enchanting for the preciousness of the decoration with vividness polychromy , which covers all the walls, and with aedicules with frontons and friezes of stucco with mythological characters. 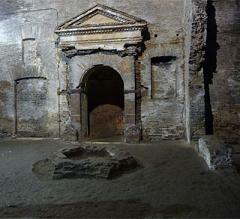 The sacellum is rectangular, covered with a vault and apsis on the bottom, with a beautiful temple-shaped aedicula. The aedicula, as mentioned on the inscriptions, contains the ashes of the founders of the sepulchre, Granius Nestor and Vinileia Hedone, also painted on the walls at the bottom. On the tympanum Dionysus with the deerskin can be observed. On the vault, a fresco with vivid colours represents the dancing of Cupids and birds between vine branches, with a background of peace and calmness. The catacombs in Rome are made up of tunnels and underground passages, and they seem veritable maze to reach a total length of many kilometers. On the walls of this intricate system of tunnels were dug rectangular niches, called loculi of various sizes, which could contain only one body, but often contained the bodies of two people and sometimes more. The Christians were wrapped in a sheet or shroud, without the cash. The loculi were closed with a slab of marble or tiles fixed by mortar. On the tombstone was written the name of the deceased, with a Christian symbol or a wish for peace in the sky. 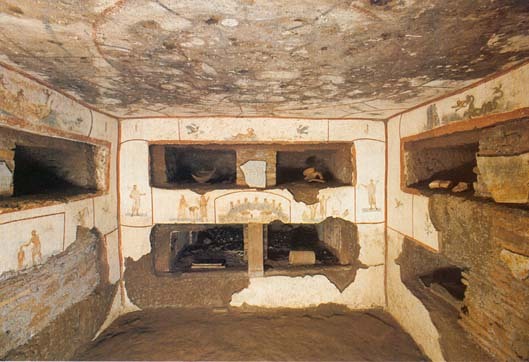 It was also customary to put the Oil lamps and small vases containing perfumes near the tombs. The tombs gave the idea of a large dormitory, called the cemetery, from the Greek word meaning "resting place". In this way, Christians wanted to affirm their belief in the resurrection of the body. Casually discovered during the construction of a garage in autumn of 1919, the Aureli hypogeum is rich with frescoes that adorn its walls. The recent restorations brought back the original colors, bringing to light important details which questioned the hypothesis formulated so far by the various researchers, who for almost a century have tried in vain to reveal the meaning of the paintings. The rooms are frescoed with scenes which are difficult to interpret and enigmatic, datable around 230. 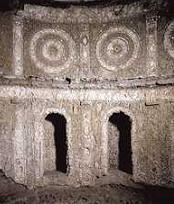 The hypogeum has two floors, the upper composed of a room that originally was semi-hypogeal (underground construction) of which only the inferior part remains, 5 meters below and the lower floor composed of two specular and completely hypogeal rooms. 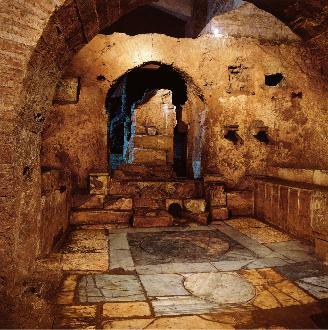 With its 3 frescoed rooms the Aureli hypogeum is one of the most enigmatic monuments of Rome, the decorations in fact have various interpretations which attribute it to official Christianity, to various heretical sects, to philosophical issues or to pure paganism.